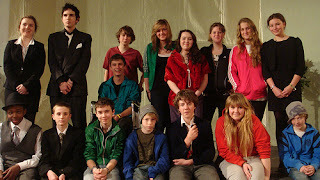 The 2011 Junior Play, Gizmo, was a production that displayed hard work, dedication, skill and at the same time was extremely humorous. Gizmo by English playwright Alan Ayckbourn is a one-act play, telling the story of Ben Mason, who, having been paralysed from witnessing a shooting, is aided by a new technological device called “Gizmo”. This Gizmo comes in the form of a rather chunky wrist-watch, yet this gadget enables Ben to move. However, he can only move in sync with the wearer of the wristwatch. Thus trouble comes about, as the wrist-watch falls into the wrong hands and is misused; poor Ben is at its mercy. The play was a challenging one as the blocking was extremely technical, due to the synchronisation of movements being central to the plot. I think that it is a great tribute to the actors to have been able to convey both the humorous nature of the play yet still have performed with such great skill. Read Kezia's full review here, and see a slide-show of photos here.